SAN DIEGO -- San Diego Chargers rookie defensive end Joey Bosa did not report to the first day of the team's mandatory minicamp on Tuesday because of an apparent contract dispute. The Ohio State product is one of five first-round selections from this year's draft that remain unsigned. Bosa also did not attend Thursday's final day of organized team activities last week. The Chargers will hold a three-day minicamp that concludes on Thursday. Bosa cannot be fined for missing minicamp because he currently is not under contract. Bosa is the No. 3 selection overall and first nonquarterback picked in this year's draft, and the main issue appears to be offset language. Bosa's camp wants it left out of his contract, according to the San Diego Union-Tribune. Offset language allows teams to recapture guaranteed money if a player is released and signs with another team. Marcus Mariota, the Tennessee Titans' No. 2 overall selection in last year's draft, also had a similar issue with his rookie contract, but the two sides ended up coming to a compromise and getting a deal done just days before training camp began. After a slow start, coaches and players have raved about the improvement Bosa has made through offseason workouts. "The progression has gone really well," Chargers defensive coordinator John Pagano said. "He's learning every day. There's going to be that rookie learning curve, where it's overload in your mind for these guys in certain things. There's a lot of different defenses and a lot of different calls, but he's getting it. He's picking it up." 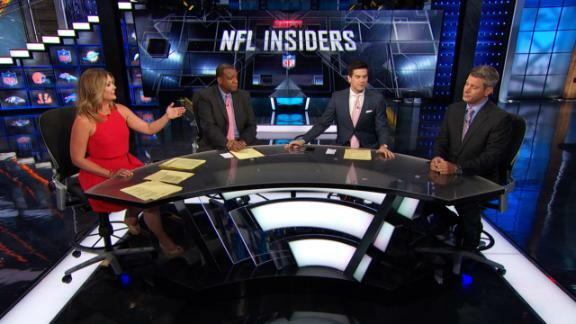 The NFL Insiders discuss the "offset language" that could mean double-dipping for Joey Bosa, who was noticeably missing from the San Diego Chargers' minicamp over an apparent contract dispute.